I have never met anyone who doesn't like passion fruit juice. 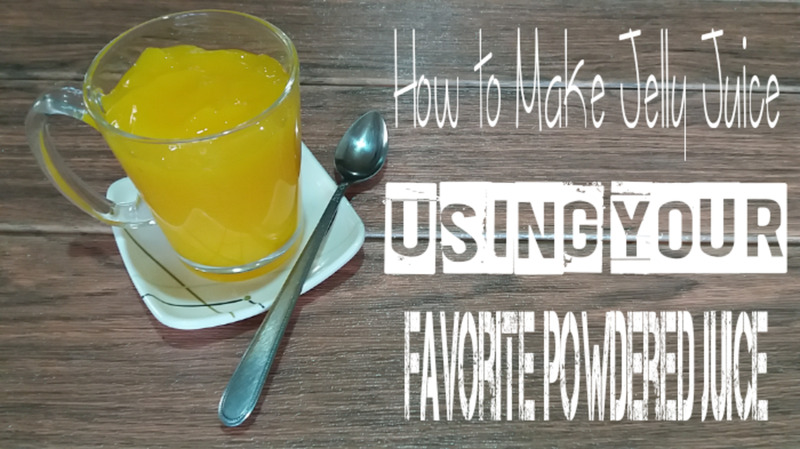 Here at our home in Brazil, our guests always drink juices and passion fruit is one of their favorites. It's an unexpected juice and so different than what they are used to having at home in the USA or Europe. This doesn't have to be a treat only reserved for vacations to the tropics as it is so easy to make at home. Although it can be bought as a ready-made drink, these have been heat treated and don't taste the same in my opinion. To experience the real taste, it needs to be made fresh. 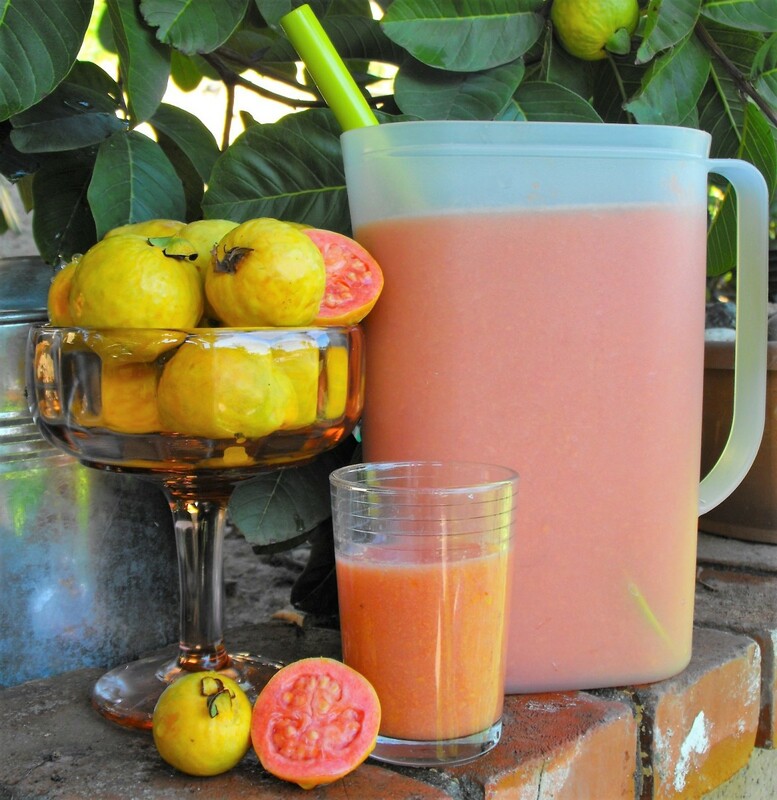 Go on treat yourself to a pitcher of passion fruit juice, it's easier to make than you think. The passion fruit grows on a vine like grapes sending out tendrils to grasp onto a surface such as a fence, wall or trees. It is a vigorous plant and has been known to overtake trees and even up onto the roof of houses. It is a plant that needs to be kept under control instead of pampered like some plants. 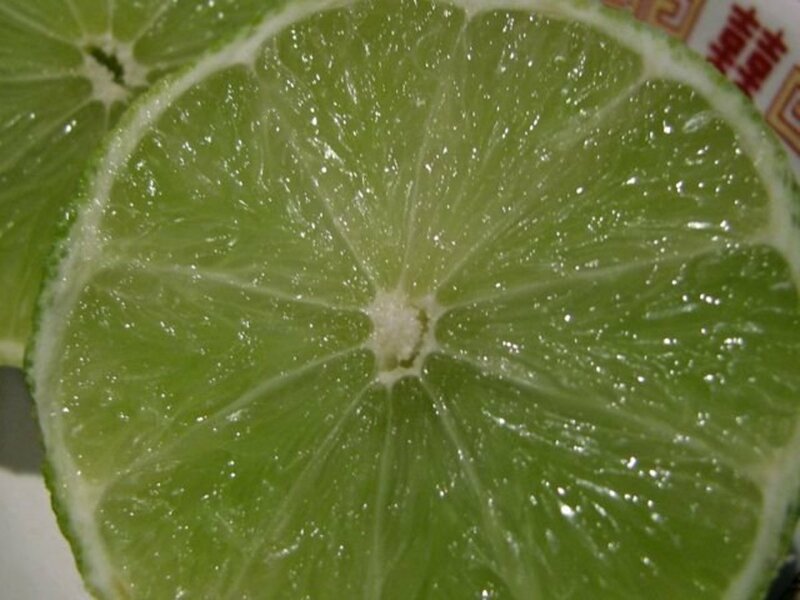 It is a beautiful plant to look at with dark green leaves, exotic flowers and green fruit which turns yellow or purple, depending on the variety you are growing. The year round availability means this is fast becoming one of our favorite juices in our home. It is quick and easy to prepare and full of vitamin C. It also has the added benefits of helping one to sleep. 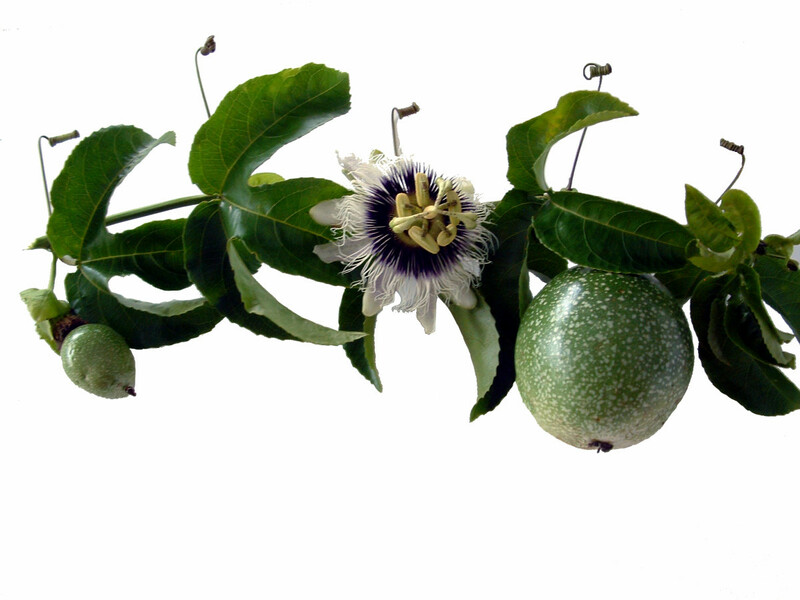 The beautiful photo below shows the passion fruit vine, flower and fruit. 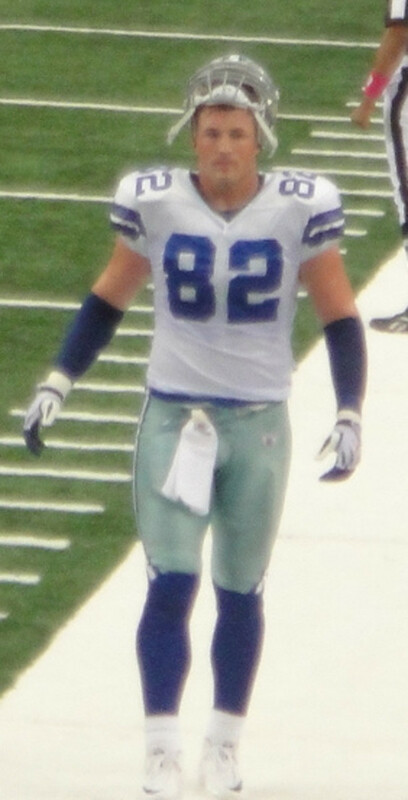 The photo is used courtesy of Mary B Thorman. 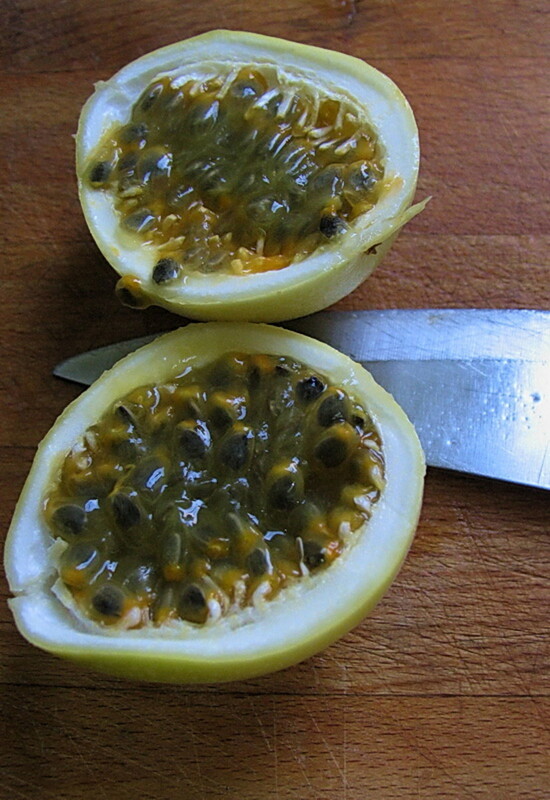 Start by cutting the passion fruit in half, from the stem to the bottom. You may need a bit of force to get through the skin, they can be a bit tough. Be forewarned, the juice will start to ooze out. Separate the halves as quickly as possible to avoid this. Lay this with the cut side up as in the photo to retain all that juice inside. Alternatively you can cut the top off and scoop it out with a teaspoon, as though it were a soft boiled egg. Here in Brazil, they will use the empty shell of the fruit to place a candle in during religious festivals and parades. If you decide you don't want to juice it, at this point you can just scoop it out and eat it with a spoon. Some varieties are tarter than others. The ones you may buy in America and Europe might be the purple variety which is sweeter and would need less sugar. Sprinkle a little sugar on top and just scoop it into a spoon and eat it, seeds and all. Scoop out the insides of the passion fruit into a blender, seeds and all. Don't worry if the white pith goes in there, we will be using a sieve to remove this. Do this with all the passion fruit. Next, add the sugar. I like to use 1/3 to 1/2 cup of sugar. Obviously, this tells you, I don't measure it, I just pour it in. I would start with 1/3 if you are using the sweeter purple skinned variety. 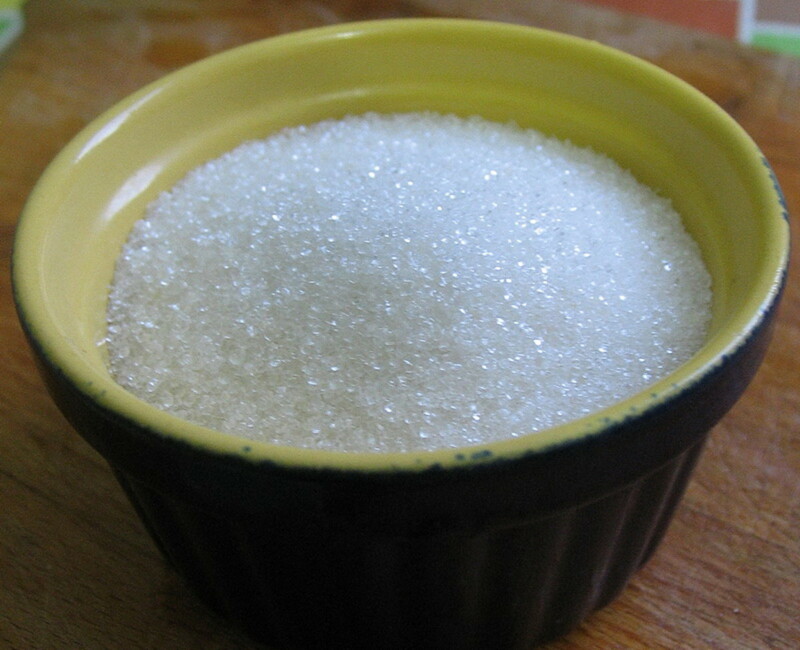 If you prefer to replace the sugar with your favorite sweetener, then adjust to taste. The next step is to add the water. I like to use chilled water and I fill this up to the 1 liter mark on the blender. That is about a quart. Turn the blender on low. You will hear the seeds breaking up but this is okay. 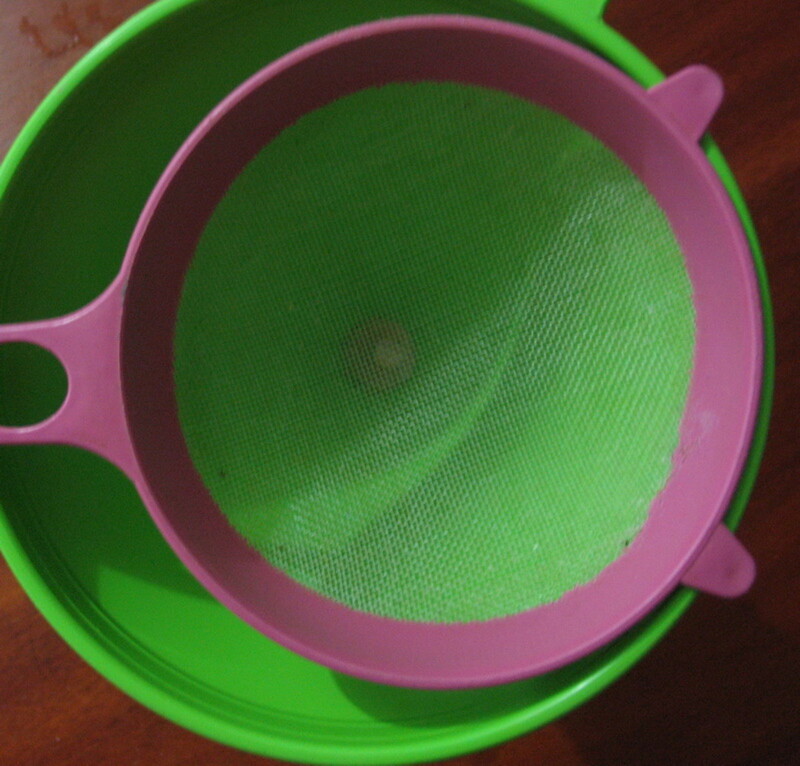 The easiest way to remove the seeds is through a sieve. I use a fine nylon sieve and place this over a funnel or a wide mouthed jug. Pour the liquid including the seeds carefully into the sieve. Using a spoon, gently stir the mixture so the seeds don't block the sieve, this allows the juice to pass through. Continue doing this until there is no more juice. You will have a sieve with foam and seeds. This can be discarded. Note: Here in Brazil, the seeds are often used to decorate cakes. 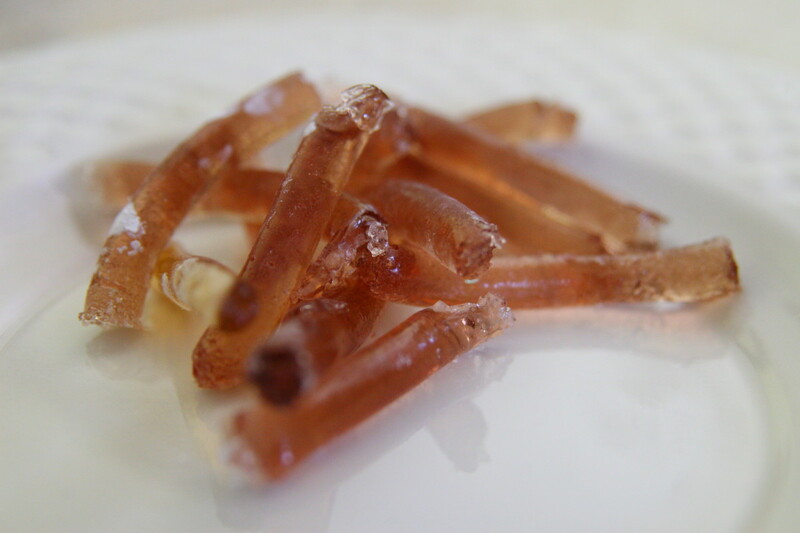 They are edible and quite crunchy. I eat them but be aware you can get appendicitis from eating seeds. They can get stuck and cause a blockage which is one cause of appendicitis. When you have passed this through the sieve your juice is ready. It can be kept in the refrigerator until you are ready for it. The juice will separate with the foam rising to the top. Just stir this up with a swizzle stick or spoon before serving. I normally just put a jug of passion fruit juice on the table with a wooden spoon, so whoever is pouring can give it a quick stir before each serving. Here in Brazil, many of the over the counter sleeping aids are from made using passion fruit. It helps to lower the blood pressure as well. Many people here know just how beneficial the various juices are and drink juice daily. How long will passion fruit juice keep? I normally make it in the evening to have it with our dinner. What we don't finish, I will have the next morning. Any juice is best when it is freshly made. You can adjust the quantities to suit what you will consume in two days. 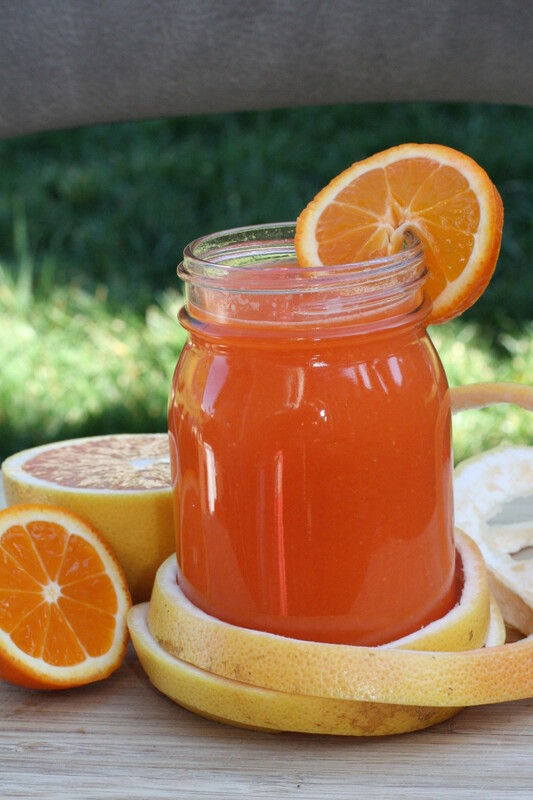 What are some of your favorite fruit juices? Here in Brazil the passion fruit is sold as the fruit. This is how most of the local growers I know sell. That said, if you wish to sell the juice, I would find a company who will buy your stock and do the juicing. If you choose to do the juicing yourself, you will have the cost of buying the machinery and all the legal and health issues to deal with. Selling the fruit yourself or through a local middleman, in my opinion is your best bet. Mary, this looks interesting and temping. I didn't know you can juice passionfruit. Thanks for the lovely photos of how it's done for juicing prep. Great hub with a juicy idea. I know passion fruit flavour and taste is really great, I'm starting passion fruit farm, as it is not easily available in market, I'm thinking to make into business with it so, could you suggest me how to make it possible into business. Your advise will highly appreciated. We do as well and it is one of our favorites. Aren't we lucky to have it available to us. My family loves passion fruit juice. We make it quite often. I can't recommend it as I haven't tried it but passion fruit juice is one of my favorites. I bought this Markizza passionfruit juice on amazon one day as I couldn't find any at my grocery that time I was whipping something up, and what do you know, I was hooked since then. Thought this might help. and it is quite tasty. It is one of my favorite juices here. I am sure they have them in the States but I believe it would be a different variety. Dark purple and slightly bigger than a golf ball. I've never seen a passion fruit here, but this drink looks tasty! I've had drinks made out of passion fruit but I've never seen the actual fruit! Maracuyá cake sounds wonderful, too! Please let me know if you post your recipe for it! You're welcome. I have plants growing here on our little farm and we love it. I have tried maracujá cake at a local bakery and may have a go at making that as well. 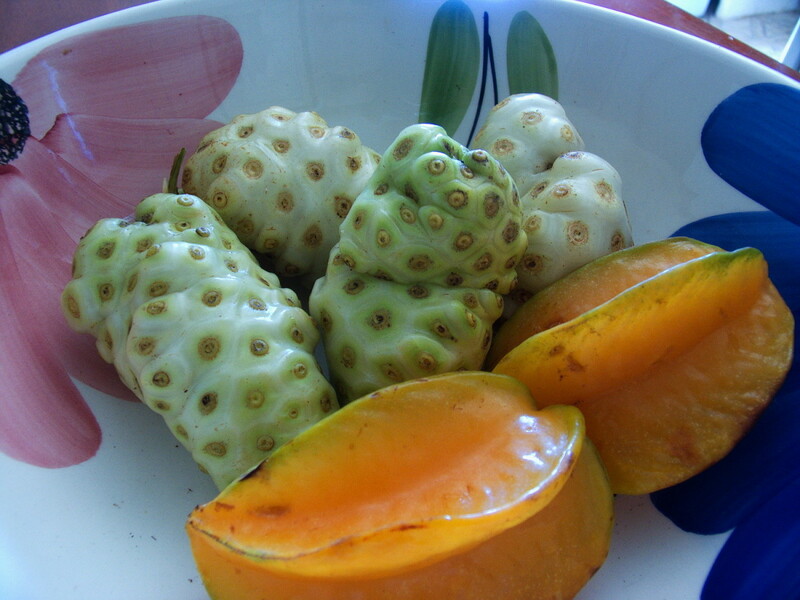 We also have maracuyá in Peru and I love to make juice with it. Thank you for sharing your recipe!